Its been a busy few days for some, racing three days on the trot is not for the faint hearted. The first club evening 10mile TT took place on Thursday 18th April. The weather was quite different to the previous week with much warmer temperatures and light winds. Fastest on the night was Stowmarket visitor Jules Bosley in 23:16, from Plomesgates Pete Hurry in 24:07 and Steve De Boltz in 24:36. Results can be found on the Club events page. The next morning, Good Friday saw the traditional Great Yarmouth Open 10mile TT on the Wortwell course along the Waveney Valley. Early starters had to contend with cooler temperatures and a stiff North Easterly headwind on the longer outer leg. In fact you can’t get much earlier than Number 1 who was Amanda Mallett who finished in 28:06. Fastest Plomesgater was Ant Birt with a sizzling 21:55, for 10th place. Steve Cave was next in 22:15, Chris Tye finished in 22:36, Trevor Caley in 23:16 and John Vidler whose finishing time of 42:06 included a late start. Back over to Tunstall on Saturday afternoon and 3 riders faced the timekeepers for our club 25mile TT, over 2 laps of the Tunstall, Bromeswell, Butley, Wantisden circuit. Fastest was Chris Tye in 1:01:46, just getting te better of a resurgent Trevor Caley in 1:02:02, in 3rd was Peter Williamson in 1:20:00. Results can be found on the Club events page. Easter Sunday morning and it was an early wake up call for those racing and helping at the VTTA East Anglia Open 10mile TT on the Wickham Market bypass. The event run for the first time by Plomesgates Ant Birt, it was well supported by Plomesgate members both racing, timekeeping and marshalling. Off first at 07:30 was Cheryl Tye who returned in 31:54. John Vidler finished in 30:45. Amanda Mallett in 28:22, Damon Parker in 25:40. Davina Greenwell started off at Number 6 and with an excellent 24:29, was leading the Women’s rankings for several minutes before she was beaten, eventually finishing 3rd. This time takes over 90 seconds off the existing Plomesgate CC Womens 10mile record, a brilliant performance. Steve De Boltz finished with a 23:36, and was just beaten by Trevor Caley (23:35) by 1 second. Our best finisher was Chris Tye in 22:34. The event was won by a familiar name Nick Partridge (VC Baracchi) formerly of Plomesgate CC in 21:09. Most riders that also competed on Good Friday were some seconds down today, as once again this course failed to live up to its potential of being quick. Thursday 11th April saw the first of our evening TT series. A cold sunny evening saw some pretty good times for such an early event. Fastest over the 5mile course was Matt O’Brien in 11:27 from Chris Tye – 11:46 and Pete Hurry – 11:48. Amanda Mallett was fastest woman in 14:44. A link to the results are on the event page. clubs Adrian Pettit in 46:19. Next Plomesgate club evening TT is a 10miler on Thursday 18th April, start is early again at 18:45. Also next Sunday at 8am sees Ant Birt promoting the VTTA East Anglia 10mile TT on the Wickham Market bypass course. HQ is at Hacheston village hall. Saturday the 30th March saw the Orwell Velo run there anuall 20mile TT on the country lane circuit from Debenham through Ashfield, Kenton, Occold and back to Debenham. The weather conditions were favourable with warm temperatures and a favourable wind. PLomesgater Nick Partridge (VC Barracchi) in 46:10.
and in 3rd place was ex Plomesgater Stu Fairweather in 55:10. Meanwhile on the traditionally fast dual carriageway course at Six Mile Bottom on the Cambridgshire border Matt O’Brien turned in an excellent time of 49:32. Our only other competitor was Chris Tye who finished in 55:11. Don’t forget our evening TTs kick off this Thursday 11th April. First event is a 5mile TT and start time is 18:45. Saturday March 23rd saw the first of our Plomesgate Open Time Trials, the weather looked promising, mild but with an annoying NW cross iwnd making the exposed parts of the course sticky. However, the riders didn’t disappoint with fast times being posted across the board. Winning the event was Andy Proffitt Ipswich BC with a time of 21:37, just beating our own Lloyd Chapman by 4 seconds. Lloyd tied for 2nd place with Ross Fawcett (Pedal Power Cycles) with 21:41. Other notable rides were Damon Parker in 27:46 and Cheryl Tye in 33:08. Traditional Suffolk season opener is the CC Sudbury Mad March Hilly 22mile TT. Starting and finishing in the pretty mediaval town of Lavenham, the course takes riders over some of the most scenic roads in South Suffolk. The scenery though was probably far from the minds of those that braved the weather conditions and lined up before the timekeeper. Very high winds, and rain added to the rolling, hilly route meant this was definitely a race for the strong men, with some choosing to forego the disc wheels and TT bikes for road bikes and traditional wheels due to the cross winds. the team prize. Ant Birt finished in 16th place with 58:59. The first Plomesgate open event of 2019 is the 10mile TT at Sudbourne on March 23rd, entries close on March 12th. Well 2019 is well underway and the new racing season has begun in earnest for some of our keen riders. with a time 49:24 to winner Ollie Jones in 47:36.
in fairly benign conditions (mild and breezy) compared to last years event had to be postponed due to snow. of 26:45. The event was won by Ben Stancombe (Velovelocity) in 20:33. Other notable rides were 2nd place for Stu Fairweather (Velovelocity) in 21:17 and Nick Partridge (VC Baracchi) in 21:45. Sunday morning saw three Plomesgaters riding the Stowmarket & District 10mile TT at Rougham. Nick Partridge made the podium with an excellent 21:01 for 3rd place. Trevor Caley did a PB with 22:48 for a top 20 placed while Amanda Mallett finisged with 26:54. The event was won by Plomesgate 2nd claim member Joe Spaulding (Ipswich BC) with 19:43. Meanwhile slightly further north long distance specialist Chris Tye was riding the CC Breckland 50mile TT in Norfolk. The calm autumnal conditions prodcued some good times and Chris managed a PB and updated his club record with an excellent 1:53:20. Its the last Plomesgate Open event this coming Sunday with the Open 10 mile TT at Hacheston 8am start. Hopefully some nice calm autumnal conditions will produce some fast times and people will wake up and realise the potential of this course. Stu Fairweather (Velovelocity) took another emphatic win on Saturday afternoon in the VC Norwich 10mile TT at Attleborough. Stu’s winning time of 19:18 was 39seconds too fast for Joe Spaulding of Ipswich BC. Best PLomesgate rider was Steve Cave in 21:02, only 8 seconds ahead of Nick Partridge in 21:10. Amanda Mallett recorded an excellent 26:39. Next morning the grey, cloudy windy conditions were far from ideal for the VC Baracchi 50 mile TT on the Waveney Valley course. Only Plomesgate representative was Trevor Caley in 2:07:12 a 2minute PB. Second claim Plomesgater Ant Birt (Team Bottrill) got “inside” with 1:58:25. The event was won by Matthew Senter in 1:45:27. A few Plomesgate riders rode local TTs last weekend. Saturday afternoon saw a small field for the East Anglian VTTA 10mile TT at Wortwell. Our only two starters were Amanda Mallett and John Vidler. Amanda finished in 27:57 and John was not far behind in 28:15. Only two riders “braved” the coinditions for the Club “5” last Thursday results are on the Club events page. News and racing roundup – Another Club record falls! Last Saturday saw Steve Cave and Trevor Caley travel right over to the North West of East Anglia to ride the Kings Lynn “25”. The conditions were far from ideal with a tough wind on the longest leg. Steve finished 15th with 58:36 and Trevor, 32nd with 1:02:52. The following morning Chris Tye braved the hot weather to ride the CC Breckland 12 hour and despite the tough conditions managed to improve his club record by 0.08miles to 255.14miles. This event was also the East District Championship, and if my observations are correct Chris took 2nd place of the East district riders, hopefully I am correct. just short of his 90th birthday. It was pupil beats teacher on Sunday morning at the Stowmarket & District 10mile TT on the Wickham to Melton course when Stu Fairweather (Velovelocity) got the better of his coach, Plomesgate’s Lloyd Chapman to take first place. Stu won with the smallest of margins winning in 20:38 from Lloyd in 20:39. In third place was Matt O’Brien in 20:52. Lloyd and Matt along with Trevor Caley (23:40) also took the team prize for Plomesgate CC. Other Plomesgate riders braving the unfavourable conditions were Amanda Mallett in 28:08 and John Vidler in 29:37. Results are here https://www.cyclingtimetrials.org.uk/race-results/17422#anchor and Race Report here https://www.cyclingtimetrials.org.uk/race-report/17422#anchor . Further west Chris Tye was riding the VTT East Anglia 25 mile TT at Six Mile Bottom and finished 14th with a 54:01. Result here https://www.cyclingtimetrials.org.uk/race-results/16628#anchor. On Wednesday 17th July Matt O’Brien continued his run of form with 6th in the East District 15mile TT Championship with a time of 30:37. The event was won by Matthew Smith (Drag2Zero) in a new National competition record for the distance of 28:27. I guess Matt’s time is a new club record. a fast morning that saw Marcin Bialoblocki smash the National “50” record by over 4minutes with 1:30:31. Sorry its been a while but here is a brief roundup of the last few weeks, apologies of I have missed anything out. Last Thursday in the VTTA 10mile event on the revived E2/10, Matt O Brien updated the club 10mile record again with a superb 19:30 for 6th place, Steve Cave did a PB with 20:12 and Nick Partridge also did a PB with 20:19. This made them the fastest team of three, unfortunately the actual prize was for the best team on standard. On Saturday Matt and Steve were in action again this time just west of Cambridge in the Team Cambridge “10”, in slightly breezy conditions both went slightly slower. Matt was 6th in 19:55 and Steve was 21st with 20:49. In previous weeks there were five Plomesgaters at the Norwich ABC 10mile TT at Wortwell. The roads were quiet as there was a football match on in Russia, but the wind was no help anywhere on the course so times were slower than usual. Fastest from the club was Matt O’Brien in 21:24 (4th), then Steve Cave in 21:37 (6th), Trevor Caley was 22nd in 24:03, Trevor Figgitt finished in 26:02 and Amanda Mallett in 28:45. On the Sunday morning Chris Tye rode the National 100 in the Lake District, not known for its flat roads, and finished in a very creditable 4:02:05 despite the very warm conditions and some mechanical issues. Just to show its not all about time trialling, Graham Smith has been getting in the results at Trinity Park on Wednesday evenings. The series finishes this week the 18th July after another successful run of events. That afternoon, 8th July saw yet another very successful edition of the Plomesgate grass track meeting at Bredfield. The highlight of the afternoon being the very exciting National 400m Championship. The weather was very hot and sunny making the track very hard and dusty, and vert fast. A big well done to Steve Upson-Smith who was our only rider, competing in his third grass track event of th season. An even bigger achievement considering he doesn’t drive, and has to rely on lifts or public transport. Three Plomesgaters rode the CC Breckland 25mile TT at Snetterton on Wednesday evening the 27th June. Blustery conditions made the going hard on the longer outward leg and meant that times were up to three minutes slower than usual. Matt was fastest Plomesgater with 52:18, for 5th place. In 10th place Chris Tye returned a 55:02 whilst Marshall Crowe made a rare appearance to finish in 1:04:54. All the club evening event results are up to date on the Club Events page of this website. A Plomesgate CC invading party gave it their all in the Iceni Velo 10mile TT in the lands north of the border last Saturday afternoon, and I am pleased to report they were imperious and victorious. Caley did a massive pb to finish in 21:46, and assist Matt and Nick in taking team rpize as well. Also finishing with her fastest 10mile tim e for some years was Amanda Mallett in 26:14, just outside the ladies club record. Whilst working down in Hampshire last week Steve Cave took the opportunity to ride the A3CRG 10mile TT near the New Forest and managed another PB of 21:01, so agonisingly close that 30mph ride! Thursday evening saw grey and drizzly conditions for the evening 10mile TT. Only four riders braved the conditions. Fastest on the night was Emilie Wix with 25:30, winning by over 2mins from Ben Bardwell in 27:38. I need to check the records but I can’t ever remember a club event being won by a female before unless Julia Shaw beat us all at some time, so big kudos Emilie. Results are on the Club Events page. Bank Holiday Monday dawned mild and windless for the Stowmarket 10mile TT on the Rougham course. The threatened overnight storms stayed away and a 7:30 start saw empty roads and a light easterly cross wid that cuased more difficulties on the return leg. Fastest Plomesgater was Nick Partridge in 21:35 for 13th place. Trevor Caley did 23:31, Trevor Figgitt did 24:36 and Amanda Mallett finished in 27:17. Meanwile a couple of hundred miles away Chris Tye was riding ten times that distance in the classic Anfield 100mile TT, on the heavy undulating roads of Cheshire. Chris finished in an excellent 4:16….which is a brilliant time for this event, considering it is no drag strip course. Thursday evening saw 19 riders brave the cool temperatures and Northerly breeze, for the club 5mile TT. Fastest was Steve Cave in 11:34 beating Ant Birt by 20seconds. Other notable rides were produced by Peter Williamson and Leon Welford, both getting inside 15mins with 14:38 and 14:42 respectively. Results are on club events page. Sunday dawned with heavy mist in the hinterlands of Norfolk for the Great Yarmouth CC 25mile TT. Riders faced a tough 2 laps of a circuit around Somerleyton and Fritton, not helped by cold temperatures and a rising easterly breeze. Jim Hardwicke was our only finisher in 1:01:33. Meanwhile Chris Tye travelled to the E21 course South East of Maldon in Essex to ride the Maldon & District 50mile TT and Chris came 11th on this tough course with a time of 2:05:00, which was good preparation for the Anfield 100mile TT next Bank Holiday weekend. 12th May – Racing Roundup – Matt O’Brien smashes club 25 mile record…again! Another week of PBs and club records….Its only early May and I seem to be updating the club records table on a regular basis. Don’t get me wrong, I am not complaining, its bloody great! This week of PBs started on Wednesday when Steve Cave broke his all time 10mile PB with a 21:09 on the P881 course near Liphook in Hampshire. OK its a good course, but Steve didn’t travel down there just to ride the A3CRG (yes its a club/team) 10mile TT, as he was working down there and took advantage of riding a local open TT, and it wasn’t a particularly good evening either! Over my 40 odd years of time trialling( and trust me some of them have been odd), I have ridden many courses starting with most of the letters of the alphabet but I don’t think I have ever ridden that starts with a “P”…. ! Back in the sticks of Suffolk and our own evening 10 mile TT on Thursday saw the riders struggling with a sticky NW wind on our tough course. Winner was Chris Tye in 23:50, from Ant Birt in 24:15. Emilie Wix seemed to surprise a few people with her 25:32, but those of us that have been around a few years will remember Emilie and Spencer Wix from a few years back and won’t be quite as surprised as quality doesn’t disappear overnight!! Full results are on club TT page. afternoon didn’t disappoint. Fastest for 7th place was Matt O’Brien in an amazing 49:10, updating his PB and the club record by a massive 1min 1second. This also earned him 4th vet on Standard prize with a plus of 16:50. Next quickest Plomesgater was Steve Cave, recording his second PB of the week with a superb 52:20 for 12th place. In 17th place was Chris Tye in 53:18 and Trevor Caley was 41st also with an excellent PB of 57:13. Just to keep the balance it wasn’t all good news as Marshall Crowe did not finish (DNF) having suffered mechanical issues after only 3 miles…..
Thursday evening 3rd May saw Robin Hawes realised some of his potential in winning the club 5 mile TT in a time of 11:06. Other notable times were Nick Partridge in 11:38 and Ant Birt in 11:49. Novice Kirstin Hamilton returned an exellent 15:34. Results are in the club events section. Saturday saw the Plomesgate Open “25” take place around the tough Tunstall, Bromeswell, Butley, Wantisden circuit. Fastest was Ross Fawcett (Pedal Power) in a new course record of 53:09, beating Plomesgate’s Lloyd Chapman who finished 2nd in 55:08. Robin Hawes was 4th with an excellent 58:47, while Jim Hardwicke finished in 1:01:50 to make the Plomesgate CC team who also took fastest team. Trevor Caley made the top 20 in 1:04:23, Andrew Hawes did 1:16:06 and Amanda Mallett finished in 1:18:18. Big well done to everyone who helped to run the event and especially to Steve Cave for stepping in as organiser for the day. Also on Saturday afternoon Matt O’Brien travelled to near Newmarket to ride the Lea Valley CC “10” and took advantage of the warm fast conditions to update teh club “10” record with a new time of 19:47. Stu Fairweather updated his PB with a 19:33. Monday morning dawned warm and sunny for the riders in the VC Barracchi 10 mile TT on the Waveney Valley course near Bungay. There was a stiff Easterly breeze making the long section difficult, and didn’t really help on the return leg. Fastest Plomesgater was Matt O’Brien in 21:01, Steve Cave was not far behind in 21:27. Nick Partridge and Jim Hardwicke were in the 22s with 22:19 and 22:55 respectively. Trevor Figgitt returned in 25:38, Amanda Mallett in 28:06 and John Vidler in 29:35.Stu Fairweather did 20:40 and joined his Velovelocity team mates in taking the team prize, led by event winner Matthew Senter in 19:41. One week and a move back to wintery temperatures for our representatives racing this weekend. Matt O’Brien, Steve Cave and Chris Tye endured the cold and miserable conditions to ride the VTTA East Anglia “25” near Newmarket, and despite the conditions all returned good times on this notoriously fast course. Matt placed 19th with 51:41, Steve did 52:43 for 27th place and Chris was only 5 seconds slower in 52:48. So three riders inside 53minutes must be a new 25mile team record of 2:37:12.
were slower due to a combination of the cold temperatures and the wind. Results are on the Club Events page. although mainly safe is quite exposed and cross wids affected some riders more than other. currently the organisers Steve Ashurst and Steve Cave are short of helpers, so please put your hand up and volunteer! challenge with the cross winds. to shelter under an umbrella! Saturday afternoon saw Nick Partridge fastest in the Godric CC Club 10mile TT at Earsham in 22:08, making the most of the first spring like conditions of the year. The following morning the good old British weather returned to its grey, cold murky best as riders presented themselves to the timekeepers at the Wolsey RC 25mile TT in the Waveney Valley. The event was won, almost by a country mile, by Stuart Fairweather in his Velovelocity colours with a stunning 53:12. He also led his team to the team prize denying the Plomesgate team of Matt O’Brien, Chris Tye and Steve Cave. Matt finished 4th in 55:18, Chris was 7th in 56:47, and Steve was 9th in 57:10. Not far behind was Jim Hardwick in 13th place with 59:28. Robin Hawes finished in 1:01:34 and Trevor Caley returned a 1:03:11. Matt also took 2nd and Chris was 3rd in the Veterans awards. The consolation is I reckon the combined time of Matt, Chris and Steve must be a club team 25mile record! What a grim, grey, cold murky night, must have been one of the coldest any one can remember, but it didn’t deter 16 determined souls from facing the timekeeper. If you could overcome the cold the wind was light and Lloyd took advantage modifying the club record for this event. Good rides also from Steve and Nick to get inside 12minutes. Leon looks like he is going to improve his PBs this year if he continues how he started, and a mention to Phil Bailey for riding a 68” fixed and mudguards and almost averaging 20mph! Matt O’Brien smashes Club “25” record..! over 2 minutes off Chris Tye’s club 25mile record with an amazing 50:11 (almost 30mph average), in the Lea Valley 25mile event at Bottisham. What a way to celebrate turning 40..! Happy birthday Matt and welcome to the Veteran ranks. Chris Tye finished in 54:12 still a very good time considering the tough outward leg into a stiff North Easterly headwind. Stuart Fairweather (Velovelocity) and 2nd claim PCC member also smashed his PB with a superfast 48:57 (30.6mph), for joint 7th place, which shows the quality of the field when a sub 49minute ride only gets you 7th place!! I can still remember the day that Alf Engers set the National 25 record at 49:24 so it just blows me away the times that are being done these days! The top 10 here were faster than that time. former professional rider Lloyd was gentle with him on the hills! record by 2secs. On a far from ideal night Steve Cave finished in 21:39, Nick Partridge in 23:08 and Trevor Caley in 24:29.
which was reflected in the times as Lloyd Chapman finished 2nd with a time of 12:02. Steve Upson_smith finished in 15:02. Well not really a weekend roundup as with the cancellation of the Saturday afternoon Stowmarket Hilly TT due to roadworks it was down to those of us that braved the cold temperatures on Good Friday morning to provide the competitive entertainment. Five Plomesgaters faced the timekeepers early on Good Friday at Wortwell. This event organised by Great Yarmouth CC has become a regular and popular feature over the years and this year there were a total of 118 riders across both events. 4th place with another excellent ride was Steve Cave with 21:45, who was also fastest Vet and best Vet on Standard!. Next up was Trevor Figgitt in 26:55, glad to finish his first event of the year incident free apart from a puncture which fortunately happened about 200m past the finish line. John Vidler completed the Plomesgate line up with a 31:43. Don’t forget the club evening TTs start in just over a week, we have some volunteers to help with timkeeping and pushing but we need many more so look at the gaps on the event list under the club events page on this website and please let me (trevor.figgitt@btinternet.com) or Pete (pete.whalan@talk21.com) know which dates you can do. It wasn’t quite a balmy afternoon but after some of the recent weather it was a pleasant change to have an afternoon of 10C temperatures and light winds for the our first open TT of 2018. The riders didn’t disappoint either with some good times for so early in the season. The event was won by Stuart Fairweather (Team Velovelocity) with winning time of 22:20. Fastest Plomesgate rider was Chris Tye with 23:50 for 7th place, followed by Jim Hardwicke in 24:06 for 11th, Robin Hawes in 13th with 24:28, Trevor Caley finished in 21st with 25:28. Chris, Jim and Robin also took first team prize. Well done to all the helpers, marshalls and timekeepers who helped to make the event a success. Also a big thank you to Amanda Mallett for taking over the reins on the day in Marshall’s absence. Results can be found on the “EVENTS” page and “Open Time Trials”. Well after we were almost given a taste of spring last week “The Beast” returned for the weekend but it didn’t deter some of our hardy souls from making their way over to Risby near Bury St Edmunds to ride the West Suffolk Wheelers Hilly 21mile TT. Although the roads were clear of snow the wind and cold meant times were a lot slower than in previous years. It turned out to be a successful afternoonthough for the few riders who braved the conditions. Best Plomesgater was Steve Cave, in his first outing as a fully fledged Plomesgater, he finished 2nd overall and 1st Vet on Standard with a time of 53:30, in 4th place and 3rd Vet on Standard was Jim Hardwicke with a time of 54:38. The event was won by Plomesgate 2nd claim member Antony BIrt (Team Bottrill) in a time of 53:10, so a good result for our lads. Well done guys and it posts a positive message for the rest of the season! The CC Sudbury Hilly 22 was the first event of the year for many East Anglians this morning including some of our own. Fastest Plomesgater was Jim Hardwicke in 14th place with a time of 54:55, not far behind was Trevor Caley improving on last years time to finish 20th with 57:01. The event was won by the promoting clubs Leon West in 50:23, but it was close as our own Stuart Fairweather (Team Velovelocity) pushed him close with 50:26. We have our Open 10 mile TT on Saturday 24th March. want for £1 a go. We will time it and show a leader board. 10 mile TT, again starting at 6:45pm. See the club website for details of the club events. can practice and then send your entry in. Again we need helpers on 21st April. promise not to leave anyone behind, i.e. go at pace of slowest rider. Watch your emails for further information. I know its already the beginning of March, but after last weeks weather it almost feels like we are just coming out of hibernation and the racing season is about to kick off big time! I hope you have all survived winter in good health and are keen to get going. Last Saturdays CC Breckland 10mile TT was cancelled due to the weather, so the first outing for some of us keen Plomesgaters is next Sundays CC Sudbury Hilly 22, using a great lumpy circuit starting and finishing in Lavenham. Won last year by Lyster Romero. Come back here next week for a report. Don’t forget the first Plomesgate Open event is only a couple of weeks away with the Open “10” on March 24th. If you can help please contact Marshall Crowe. I will be adding the list of club events shortly to the Events page. Don’t forget these events rely on your support to go ahead, so please volunteer to timekeep and/or push off or the events might not happen! Just spotted that Chris Tye did a 1:55:13 in this mornings CC Breckland 50mile TT. Thats another club record updated by Chris! Next Sunday September 10th is the Plomesgate CC Open 10mile Time Trial on the Wickham bypass. The start sheet is available online here Start Sheet . Stuart Fairweather si the organiser, he is still in need of help on the morning, HQ is Hacheston Villahe Hall, please contact Stu if you can help at stuartfairweather@yahoo.com. Last weekend saw a couple of local events take place. On the Saturday Chris Tye placed 9th in the CC Breckland “25” with an excellent time of 53:29. On Bank Holiday Monday on similar roads Trevor Caley just missed his pb by 1second in the VC Norwich “10” . The evening time trial series has now drawn to a close and teh final results are on the club events page. I will be shortly sending out a reminder for people to claim any standards they think they might have achieved. Check out the Club Standards page, there are still a few more open events in which to improve. Fancy a dirty weekend in Suffolk? The Ruff Stuff 25 (maybe 22 mile this year) is back. Woodbridge Rotary Club are promoting the event in aid of the various charities they support and will be using the same route as I used when I promoted the event. This year it may be only 22 miles due to forestry harvesting, but it will still be a challenging route. They are just finalising the hall booking, so it should go ahead OK. The date for your diary is Sunday 15th October, Butley Village hall HQ, not far from Woodbridge. Sign-on from 9am and riders set off from 9:30am – 10am. The organisers really want this to be a success, so it you could feedback via this page your intention to ride it would be useful. Suitable for CX and MTBs, Recommended age range of 12 to 95 years. Remember “the wetter the better” for some parts of the route. Whilst it’s not a race, I think they will be awarding gold, silver and bronze certificates for your finishing times. Tea and cake should be in abundance. Results of last Thursdays evening 10mile TT are on the club events page. Although windy some quick times were produced with Lyster winning in 21:31, a few other people improved on their best times of the year. This was the last evening 10 of this years series, two 5mile events remain and don’t forget the earlier start times of 6:45pm. Sunday morning dawned cool and windy as Trevor Caley lined up for the VC Baracchi 50mile TT. Trev battled the conditions to improve his PB to 2:09:22. 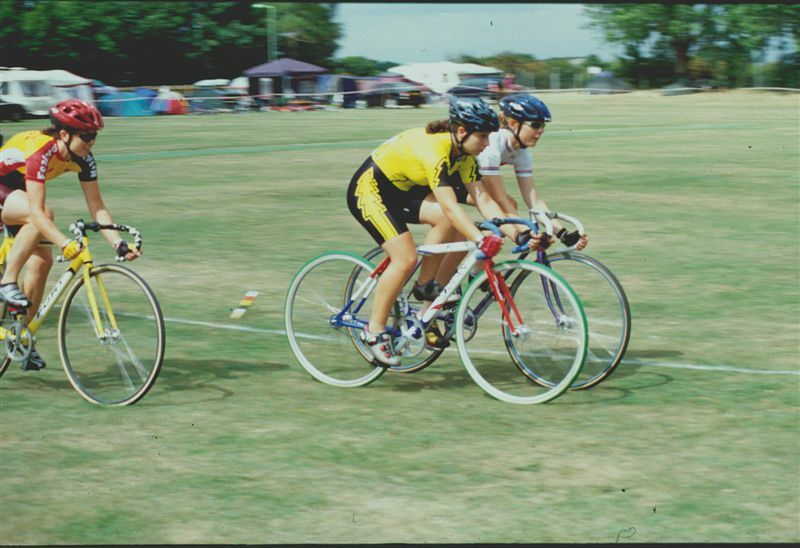 Also congratulations to Amanda Mallett for updating the Women’s “10” record, beating Viv Broughton’s 17 year old figures in the Stowmarket “10” on 6th August, and my apologies for not updating the website sooner! Sunday morning saw a team of Plomesgaters riding the Diss “25” on the tough rolling roads between Bressingham and Thetford. Fastest of the club and in 12th place was Matt O’Brien in 57:21, he was backed up by Trevor Caley with 1:02:36 and Adam O’Keefe in 1:04:17. Other riders of note were Stuart Fairweather in 56:51, Ant Birt in 58:56 and Steve Cave in 1:00:02. Last Thursdays club 5 mile TT was won by Lyster Romero fresh from his bronze medal ride in eth National Junior 25mile TT. Saturday 5th August saw an amazing ride by 2nd claim member Lyster Romero (TBW Bootecchia-Wigmore RT), from Wickham Market, take the bronze medal with a stunning time of 49:42 in the National Junior 25mile TT championship in South Wales. Also on Saturday afternoon Trevor Caley travelled over to ride the Kings Lynn “25”. Fortunately the bad weather had ceased as Trevor got started and he covered the wet roads in a very respectable 1:03:04 to finish 35th and pick up some useful SPOCO points. Sunday morning 6th August saw several Plomesgaters and some 2nd claim Plomesgaters ride the Stowmarket & District CC 10mile TT on the potentially quick Wickham Market by pass. Fastest PCC rider and finishing in 6th place overall was Matt O’Brien with a superb PB of 21:00. One place behind Matt was Stu Fairweather (Velovelocity) in 21:15. Next PCC rider was Trevor Caley with 23:34, and close behind was Steve Upson-Smith with a big improvement to 23:37. Next was Adam O’Keefe in 23:58. Amanda Mallett finished in 27:13 and Leon Welford in 31:10. Chris Tye was our only representative in a damp VTTA “25” on the E2 course early on Sunday 30th July. Chris finished in 16th place with 54:01. Our 2nd claim riders did well in the same event with Stuart Fairweather (Velovelocity) 8th in a new PB of 53:11, and Steve Cave (Wolsey RC) finishing with a 56:03. There are a number of Plomesgaters riding the Stowmarket & District Open “10” on Sunday 6th August on the Wickham Market bypass course, its a 7:30am start if you want to show your support! Club TT results updated with last nights results. Only 9 starters again, on a cool windy evening on damp roads. A good win for Matt O’Brien in 22:51 beating Trevor Caley by exactly 2minutes. Saturday 22nd July saw a couple of Plomesgaters and some 2nd claim Plomesgaters battling the westerly winds and the busy summer holiday traffic in the Anglia Velo “10” at Risby. It was another superb PB for Trevor Caley with his first sub 23minute ride in 22:52, another 18 seconds back was Adam O’Keefe who also PB’d with a 23:10 ride. The event was won by our own Lyster Romero in 20:20 now riding for TBW Bottecchia Wigmore RT, beating another PCC regular Stuart Fairweather (Velovelocity) into 2nd place by 23 seconds. Results is here Anglia Velo Result. Event report is here Anglia Velo Report. The last three evening TT results are in the Club Events page, the last two being won by Lyster as he builds towards his next big target the National Junior 25m TT, on the 5th August in South Wales. Last Thursday saw some good improvements from Matt O’Brien with his first sub 23minute ride (22:42) on our “10” course, and another improvement for Trevor Caley (24:49). On Saturday July 1st three Plomesgaters rode the Norwich ABC “10” on the Wortwell-Bungay course. It was a strange afternoon with a North Westerly breeze. Fastest from the club was fast improving Matt O’Brien with a new PB of 22:18, next up was David Gitsham in 23:13 and Adrian McTigue in 24:17. In 3rd place overall was former Plomesgater Lyster Romero in a superb 20:55. and in 5th place another former Plomesgater Stuart Fairweather in 21:35. This afternoon saw the latest version of the Plomesgate Grass Track meeting at Bredfield. Although the entries were slightly down on previous years, the weather was probably the best for some time, and the racing was as exciting as usual. The event was run off in normal well organised fashion by Pete and Bev, and everyone seemed to have a good time. Lets hope entries can recover for any future events. Grass track seems to be going through a tough time at the moment after a few years when it seeemed to be on the revival. It seemed like a perfect evening, not much wind, and about 19C, but we will never know what people would have done on the club “10” as it had to be shortened to 7.2m due to temporary traffic lights in Tunstall village. So the emergency circuit had to be deployed. From the 11 starters, Lyster was quickest in 16:01. Full results are on Club Events page. Meanwhile over on the Cambridgeshire border Chris Tye and Marshall Crowe were riding the East Anglian VTTA 10mile TT on the potentially superfast E2/10. Chris finished with a time of 21:14 and Marshall in 24:29. The event was won by Jason Bouttell in 18:44. Don’t forget its the Plomesgate Grass Track meeting on the field behind Bredfield Village Hall on Sunday, 1st July. Racing starts at 1pm, if you are helping get there at least 30mins before. There has been a lot happening in the world of time trialling involving Plomesgate riders. Starting at the beginning of June. First of all a big congratulations to Amanda Mallett who updated the club Womens “25” record in the VC Norwich event back on 14th May with her time of 1:10:12. Some of you will remember Evert. Well he made a brief return to the UK at the beginning of June, and soon showed at 67 he can still mix it in the world of UK timetrialling. On the 7th June Evert and Chris Tye represented the club in the East District Championship “25”. On a breezy evening around two laps of the Hingham circuit, which is by no means fast. Chris came 11th in 1:01:12 and Evert was 13th in 1:02:58. The event was won by Lloyd Chapman in a new course record of 52:46. Then on the 10th June on the Kings Lynn “10” course, Evert was our only finisher in the EDCA Championship “10” in a time of 24:15, giving him a plus of +4:17 and 5th place in the Vets category. In the Godric CC Evening Open TT on the 20th June, Trevor Caley smashed out an excellent 24:10 for 6th place. He was supported by Adam O’Keefe with 25:23, and Amanda Mallett in 28:26. On the Bottisham course on Thursday 22nd June in the VTTA East Anglia “10”, Chris Tye was 8th with 21:02. Back up on the B10/43 (Wortwell to Bungay) a few days later for the Iceni Velo “10” on Saturday 24th June, Matt O’Brien rode an excellent PB of 22:41 for 8th place. David Gitsham finished with 23:10 for 15th and Trevor Caley was in 19th place with a 23:29. This gave Plomesgate CC the Team Prize. Adam O’Keefe improved his PB to 24:12 and Amanda Mallett got inside 28minutes with a 27:57, and all this on a very windy afternoon. The event was won by Daniel Bloy in 20:34 with Stu Fairweather 2nd in 21:18. I have updated the featured image with a pic of Big Trev in full flight! Glutton for punishment Trevor Caley then had an early start the following morning for the Godric CC “50” on the same Waveney Valley roads. The wind had not diminished and Trev had to contend with 26miles of headwind but pushed his way through to a PB of 2:10:33 knocking nearly 3 mins off his previous best for 50miles, and finishing 12th. Last weeks 5mile and this weeks 10mile TT results are now on the club TTs page. I will endeavour to get some news to you regarding recent TT results. Lots of exciting stuff including recent East District events the ECCA 100 and loads more……….. Results of the club evening 5mile TT from last night are in the events/club TTs section. It was a warm evening, won by Stu Fairweather in 10:57 from Ant Birt in 11:24. Big Trev whooped as he crossed the line as he realised he had cracked 12minutes for the first time with 11:52. Amanda won the ladies battle with 13:53. No its not “Deja Vu” its just becoming a regular occurrence so I lazily kept the headline. Bank Holiday Monday morning saw Trevor Caley and Amanda Mallett line up for the Stowmarket & District 10mile TT at Rougham. The overnight thunderstorms had cleared through and the fresher conditions and light winds were taken advantage of by many of the riders. Trev did a superb 23:25, while Amanda improved to do a 27:19. The event was won by Jason Bouttell in what is probably a new course record of 18:55. Results of last Thursdays club TT are on the website under the events/club TTs page. The new chipped surface slowed most riders down except Onform RTs Ollie Jones!! It was worth the journey “over the border” into Norfolk for three Plomesgaters on Saturday 13th May when they rode the VC Norwich “25” near Snetterton. This course proved it can be fast despite the winds when the National “25” was run on it last year. Fastest of our riders was Chris Tye in 54mins, Amanda Mallett was pleased a personal best time of 1:10:12, but the happiest rider on the day was Trevor Caley who improved his 25mile time by a massive5mins 10secs to post an excellent time of 57:56. Sunday 7th May saw the Diss and District CC run their Open 10mile TT on the course they have traditionally used for their Tuesday evening TTs. Its a roling, lumpy out and back course, but teh road surface is good. The weather was cold and the wind was troublesome being the same Northerly we have endured here in teh east for what seems like weeks now! David Gitsham was the best of the Plomesgate riders with 24:17 for 22nd place. He was pushed close by Trevor Caley with 24:19 in 24th place. True grit has two meanings this week, it describes the fortitude of the 13 riders who did the 5 mile TT this evening in the cold windy conditions, results are in the Events/Club TT section. It also describes the state of the roads through Butley, Wantisden and Tunstall Forest which may jeopardise the Open “25” on Saturday. A decision will be made tomorrow Friday 5th May, so watch this space! Unfortunately due to the newly laid chippings on the roads that the “25” course uses, it has been deemed it is unsafe to run the Open “25” tomorrow, 6th May, so the event has been cancelled and all riders will receive a full refund of their entry fee. Plomesgate CC open “25” is on Saturday 6th May on the Tunstall, Eyke, Bromeswell, Butley, Tunstall circuit. I can remember getting sunburn once on May Bank Holiday Monday, in the UK, no chance of that this morning at the VC Baracchi Open 10mile TT on the Redenhall to Earsham course. Although the rain had stopped the early starters still had wet roads and a cool 9C to deal with, while as the event progressed the SE cross wind got harder for the later starters. Fastest from the club was Chris Tye in 22:24, Adrian McTigue did 24:10 from an early starting number, Trevor Caley finished in 24:44, closely followed by fast improving Adam O’Keefe in 24:47. Trevor Figgitt was just outside his target time with a 26:10 and starting from a very late number Amanda Mallett produced her fastest of he year so far with 28:53. Next up for many is the Plomesgate CC Open “25” on Saturday 6th May. If you are not riding then Stephen Ashurst could do with the help on the afternoon at Tunstall. See you there! Marshall Crowe was the sole representative at the VTTA East Anglian Open “10” at Risby on Sunday morning. Although the conditions were calm it was very cold and tired legs from the club “25” the afternoon before prevented Marshall from gaining the elusive 24minute ride, he finished with 25:04. Plomesgate CC are delighted to announce a close working relationship with Action Medical Research . The well known UK based charity are associated with organising cycles rides across the UK to help raise funds for medical research including the very popular local event run in May each year , the Suffolk Sunrise . The club have moved their annual Open 25 Time Trial to coincide with the running of the Suffolk Sunrise to give riders the opportunity to experience a TT on the type of roads they have become accustomed to for the Sportive event and provide a more challenging weekend for more traditional TT riders . The objective of the relationship is to encourage more riders to participate in the Action Medical events and realise the key work the charity do of which organising very well managed cycling events is a means to an end . Action Medical Research is a UK-wide charity funding vital research to help sick and disabled babies and children. We have been funding medical breakthroughs since we began in 1952 and almost everyone has been touched in some way by our ground breaking work like the first polio vaccines in the UK, ultrasound in pregnancy and the rubella vaccine. The research we have funded has helped save thousands of children’s lives and changed many more. Every mile you pedal will support studies that could one day help children like Emily born six weeks early as a result of her mum developing pre-eclampsia, Joey who at five was diagnosed with brain cancer and Noah who age three stopped talking and understanding speech and was diagnosed with the rare brain condition Landau Kleffner syndrome. With your support we can fund life-changing research for some of the UK’s sickest babies and children. Every mile you pedal will make a difference. It was a mixed afternoon for the Club “25” this afternoon. 9 riders presented themselves to the timekeeper some relishing the event more than others! A cool North Easterly breeze seemed to rise for the 2nd lap making it a tough afternoon. Chris Tye won on 1:00:44, from James Hayward of Ipswich Tri Club in 1:04:06 and Trevor Caley in 1:04:53 another course PB. Results are on the club events page. It was a cool and breezy early Sunday for the Wolsey RC Open “25” on the Wortwell – Earsham road. Wolsey Rider and 2nd claim Plomesgater Steve Cave was first man off and overcame the cross wind out and head wind return legs to finish in 59:25. Fastest club rider was Chris Tye in 57:53 and Trevor Caley did a solid ride with 1:04:11. Unfortunately the same “Bungay Gremlins” that got to Trevor Figgitt on Friday, did far more damage to Amanda Mallett’s race. About 3miles from the finish her rear derailleur broke which had a knock on effect causing damage to the frame, and rear wheel, and left Amanda having to carry her bike to the finish. It was a cool and grey morning that welcomed the riders at Wortwell for the traditional Good Friday “10”. First off were the Women and Juniors, Amanda Mallett did a 28:58 and the event was won by ex Plomesgater Lyster Romero in a pb of 21:18. Next up were the Men/Vets the temperature was rising gradually but so was the wind for the slightly shorter return leg. Trevor Caley continued to show his good form with a 24:32. David Gitsham finished with 23:40 and Trevor Figgitt punctured 3 miles from the finish and rolled across the line in 30:50. Meanwhile Chris Tye travelled up to the V718 west of Hull, where the wind made the longer leg of teh course difficult. Chris still managed a sub “21” with 20:54. The first evening TT has just been completed. Riders had to contend with a cool evening and a stiff breeze, which had an effect on times. First place went to Ipswich BC visitor Adam Colbert in 11:36 from Jim Hardwicke in 11:53. Full result can be downloaded from the Events/Club Events page. Its a sign Spring is here as the season really starts to get going. Last Tuesday evening Nick Partridge and Adam O’Keefe rode the Diss 10mile TT on the Brockdish course. It was Nick’s first outing and he returned a very respectable 23:17, whilst Adam continues to improve with a 25:27. On Saturday afternoon Trevor Caley and Amanda Mallett took the long trip over to the Kings Lynn 25mile TT. Trevor took advantage of the smooth road surface and posted a very good time of 1:03:27, whilst Amanda confessed to finding it tough in her first 25miler for quite a while but was still happy with 1:18:53. Adam continued his foray into the wierd and wonderful world of timetrialling with an amazing improvement on the Earsham course, He improved to 24:55 in the Godric club event. Meanwhile over on the super fast E2 course on the Cambridge Suffolk border Chris Tye is rumoured to have smashed the club “25” record with a 52:48. I say rumoured because the official result is not yet published, once confirmed we will let you know. The event was won in 45: 20 by John Dewey, which if confirmed is the 3rd fastest “25” of all time in the UK! Don’t forget its the first Plomesgate club event of 2017 on Thursday 13th April. Its a “5” and start time is 18:45. Don’t forget to regularly check the “Events/Club Time Trials” page on this website for updates on the timekeeping and pushing rota and for the results. Other News….. Marshall Crowe was instrumental in taking an Eastern region team to the Junior Tour of the Mendips on 8th/9th April. Amongst the team was ex Plomesgater Lyster Romero. Lyster finished 21st in the opening Prologue TT losing 28secs to the winner. That afternoons road stage was abandoned due to a nasty crash. Day 2 saw a tough road stage over some hard climbs, again Lyster performed really well to finish 36th, 1:35 down on the stage winner, and giving him 32nd place overall. Four Plomesgaters presented themselves to the timekeeper just outside Debenham on a sunny but windy afternoon. Fastest of the foursome was Adrian McTigue who finished with a time of 49:48 for a top 20 position. Next quickest was Trevor Caley (aka “Big Trev) who continued to power his new lightweight torso to a course PB of 52:08, newcomer to timetrialling Adam O’Keefe completed the lumpy course in a very good 53:41, whilst Trevor Figgitt (aka “Little Trev”) pootled around in 57:44 and is pleased to report that despite the terrible road conditions his bike held together, and wishes his body and head had done the same!! The event was won by Ollie Jones formerly Ipswich BC and now riding for Team Onform in a new course record of 42:39. It didn’t seem like an afternoon for course records as even the long drag up through Kenton to Occold was not made easier with a cross wind in places. Saturday 25th March saw the club promote their first Open TT of 2017. It was a gloriously sunny afternoon but there was no hiding in exposed places from the cold and blustery easterly wind. Although this affected some of the times, most riders posted decent results. The club was represented by 9 riders, in a field of nearly 70 riders of which two were novices. Matt O, Brien returned an excellent time of 25:55 for his first ever race, finishing just behind seasoned “TTer” Trevor Caley in 25:38 for 31st and 32nd places respectively. Adam O’Keefe also finished in a very respectable 26:42 for his first venture into timetrialling. Other Plomesgaters were Chris Tye in 23:33 for 6th place, Jim Hardwicke in 23:59 for 14th, Adrian McTigue in 24:41 for 25th just ahead of David Gitsham with 24:57 for 26th. Amanda Mallet was the best of the Plomesgate Ladies in 30:31, ahead of Julie Tooke in 34:21. Lloyd Chapman honoured his scratch position with a very fast winning time of 20:40, only 27seconds away from his own course record. Thanks to all the marshalls, pushers, timekeepers and helpers without whose support these events would not take place. There is an official report on the CTT website at CTT Open 10 Race Report, and full results can be found on the Events, Open Events page on this website. On Saturday 18th March Chris Tye was the sole Plomesgate representative in the West Suffolk Wheelers Hilly 21 mile TT. The course is two laps of a 10.5mile circuit based at Risby and being quite exposed in places the wind played a big factor. Chris finished with 52:13 for 14th place. In 3rd place was Stuart Fairweather now riding for Team Velovelocity. Also on Saturday afternoon Lyster Romero now riding for Wigmore Racing Team finished in 4th place in the ECCA “10” on the E2/10 with a 21minute ride. On Sunday morning Jack Hardwicke (Team Strada) rode strongly in the Ipswich Road Race at Framsden to get in a break eventually finishing 4th. Don’t forget its the clubs first Open Time Trial of the new season on Saturday afternoon on our Sudbourne/Tunstall course. If you are able to help then please contact Marshall Crowe (marshall.h.crowe@btinternet.com). For those that are competing in the SpoCo East TT league, remember that you need to get your entry in (by post) before your first counting event. The results are taken from your best placed 7 events throughout the 2017 season (3 x 10 miles and 4 x 20+ miles). We’re now going to be updating the web site with regular news items (in a blog style) and no longer be producing newsletters. The author found it challenging to produce the newsletter whilst working full time and training. We hope this will be more efficient and we should be able to keep you updated more frequently with results and what’s happening around the club. We welcome a couple of new members – Matt O’Brian and Adam O’Keeffe. Those that still need to renew their 2017 PCC membership can do so by contacting Pete Whelan, (pete.whelan@talk21.com). During the week leading up to Sat 4th March the weather forecast for the CC Breckland 10 mile TT was not looking good. However, the sun came out and the race took place on dry roads. Seen by many as the first open of the season it attracted a large field with some quick riders from throughout the East District. Despite the strong winds the milder temperatures led to some fast times with many riders 1-2 mins quicker than last year’s event. Lloyd Chapman (Banks/Catford CC Equipe), who many of you will be familiar with from our PCC club events on a Thursday evening, put in a blistering ride to take top spot and break the course record. If you’re not racing we can always do with help; either marshalling at various points throughout the course, or running the results from the time keepers or back at HQ in the kitchen. Or you could bake a cake? We can always do with volunteers to either push or keep time. It’s good to share these around. Full training can be provided. Club Jerseys £30 each, good stock of sizes, plus a S and an XL in the old design for £10 each. Contact Pete Whelan (pete.whelan@talk21.com).